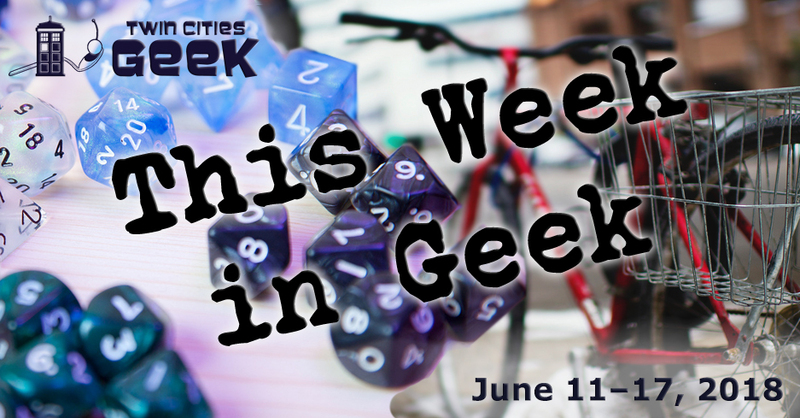 Welcome to This Week in Geek, your guide to events of interest to the Minnesota geek community for the week of Monday, June 11th to Sunday, June 17th. When: Monday, June 11th at 6:30 p.m. When: Tuesday, June 12th at 9:30 a.m. Giving an excellent monologue audition is one of the first steps many actors take before getting hired for a role, and this class will help you shine. Reading a monologue is an open space for creative choices that can give extra nuance to a piece, and makes the whole narrative more compelling with implied conflict, emotion, and more. No experience is necessary for this class led by an experienced teaching artist from the Guthrie. When: Tuesday, June 12th at 7:00 p.m.
Books & Bars is an “open public book club show” hosted and moderated by Minnesota Public Radio senior producer Jeff Kamin that provides attendees with “a unique atmosphere for a lively discussion of interesting authors, fun people, good food, and social lubrication.” The book being read and discussed this month is The Hate U Give by Angie Thomas, an award-winning young adult novel following the story of a woman drawn to activism after a police shooting of a friend. Enjoy a night of community and tea with Tea and Meeples, a weekly gathering of friendly geeks at Panda Castle in Richfield. This week, the group will get together for a night of crafting and enjoy a dinner of Thai-pineapple fried rice! When: Tuesday, June 12th at 7:30 p.m.
Come and experience YogaQuest, a blend of yoga and fanfiction storytelling led by certified yoga instructors. Experience a yoga workout experience and a story at the same time. The theme for this week is Ocean’s Eleven, so develop the flexibility and core strength to pull off a heist. This event costs $15. When: Wednesday, June 13th at 7:00 p.m. When: Wednesday, June 13th at 9:15 p.m. Enjoy an evening of community and movie magic under the stars! Movies start at dusk and are free and open to the public, and screening this week is Jumanji: Welcome to the Jungle. Bringing a blanket or lawn chair is recommended, and children under the age of 10 must be accompanied by an adult. When: Thursday, June 14th at 6:00 p.m. The Science Museum of Minnesota will be pairing with Twin Cities Pride for a special pride event, honoring the LGBTQ+ community with a special night of Social Science. This special Social Science event will focus on the science behind sexuality, rainbows, drag, and more. Flip Phone will be presenting a special drag show for this event. Social Science is 21+, with tickets going for $18.95 for non-members. Come to GlitchHQ on the second Thursday of every month for an open game of Dungeons & Dragons or Mouse Guard, welcoming new and experienced players alike. The game is played in an open or sandbox style, so don’t worry about missing individual sessions for overarching story—just show up, roll up, survive, and level up! Materials and rules provided. When: Thursday, June 14th at 7:00 p.m. When: Friday, June 15th at 6:00 p.m. When: Friday, June 15th at 7:00 p.m. When: Friday, June 15th at 8:00 p.m., and Saturday, June 16th at 3:00 and 8:00 p.m.
As geeks, we seem to be drawn to imaginary sports such as quidditch, zero-g laser tag, brutal-blood sports involving child tributes, and podracing, so come and see the greatest sport that never was: Human Combat Chess. This game looks like chess on the surface, but unlike chess, the results of moves are not certain and come down to choreographed fights between the human pieces involved. General admission is $18, while kids can get in for $5. Want to learn more about Human Combat Chess? Check out our piece on last year’s performances! When: Friday, June 15th 8:30 p.m. When: Friday, June 15th at 9:02 p.m. and Saturday, June 16th at 9:02 p.m.
Northern Spark—the annual all-night art festival that lights up the Twin Cities—will return this year and will be trying something new: a two-night festival! Expect to see a large number of art installations that light up the night throughout festival areas, all centering around this year’s theme: Commonality. How do we create common spaces and platforms that resist discrimination, open dialogues, and create relationships? Events will take place at the Commons, the Minneapolis Central Library, and Nicollet Mall between 3rd and 8th Streets. See the website for more details on art installations, and figure out how to plan your night. When: Friday, June 15th at 9:30 p.m.
Ladyfriend is a “three-human comedy group” known for improv, creating fun videos, and enjoying candy. Becky Wilkinson Hauser, Beth K. Gibbs, and Jen van Kaam will show you what new worlds can be built when three charming weirdo BFFs share the stage, so prepare to be delighted. General-admission tickets are $10. When: Saturday, June 16th at 10:00 a.m. The Stone Arch Bridge Festival will be returning for its 24th year of music and art on the Minneapolis riverfront! See a wide variety of bands on three different stages, take part in art activities, and enjoy great local beer, food, and more. There will family-friendly activities like family yoga, music, films, and activities from the Science Museum, so be sure to bring the kids. Parking can be a challenge for this event, so cycling, public transit, and other means of getting there are strongly encouraged. When: Sunday, June 16th at 11:30 a.m. Slap Happy Studios are holding workshops to develop ideas for their future project, Footprints, about the effects of a Bigfoot hunt on a small town. This event will be a workshop for Bigfoot fans and creatives who want to help generate ideas based on tropes and elements from genres like horror, b-horror, and camp. Let your cryptozoological and other geek knowledge shine! Fill out the Google form in the above link if you plan to attend. When: Saturday, June 16th at 2:00 p.m.
Help keep the Lillith afloat and delighting CONvergence attendees this year! The Lillith is a CONvergence party room focused on pirates, mermaids, and other denizens of the sea. Enjoy special guests like Soledad of the Lillith, mermaids, pirate games from Level Up Games in St. Paul, a massive swing, snacks, beverages, a cardboard pirate ship, and pirate trinkets for sale. When: Saturday, June 16th at 8:00 p.m.
Equilibrium—a monthly literary event focused on Lao writers from the diaspora and their experience living between two worlds: the Lao and the American—returns for a June event with spoken word readings and a musical backdrop. Topics may include pre-colonial Laos, the aftermath of the Secret War, refugee identity formation, pop culture, social justice, and more. This month will feature readings from Spoken Word Immersion-fellow Saymoukda Vongsay, Catzie Vilayphonh, and Bryan Thao Worra, with beats provided by DJ Nak. When: Sunday, June 17th at 10:00 a.m. Enjoy a summer morning outdoors playing the greatest sport in the wizarding world: quidditch! This event is hosted by the Twin Cities Quidditch Club, and is a great opportunity to get some exercise, make some great Harry Potter-loving friends, and catch that golden snitch! When: Sunday, June 17th at 12:00 p.m. When: Sunday, June 17th at 12:30 p.m. Gender Jam—a meetup group for trans, gender-nonconforming, questioning, and intersex youth—will be meeting up for an afternoon of community and fun. This week, Gender Jam will be heading down to enjoy the Mondo Queer Beach Party: Pride Edition, a multi-generational queer beach party to celebrate and enjoy the summer sun! Also, the group will be working on making trans swag. As always, bring your permission slip if you are under 18.